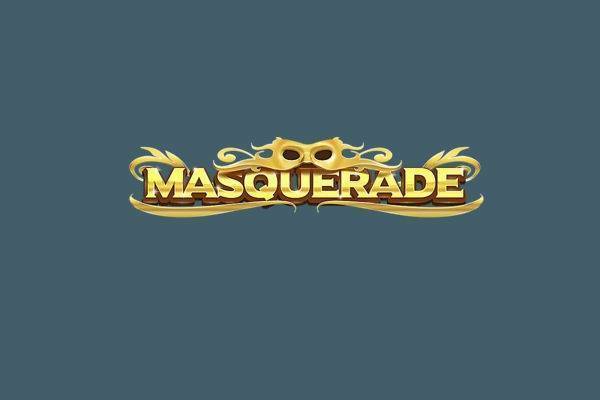 Beaming with Renaissance elegance, the Masquerade slot from Red Tiger Gaming is a game filled with mystery. This 5 reel 20 payline game has a slightly unusual format, with the first and last reel shorter than the others, and it’s decorated by golden masks that will very much remind you of the Carnival in Venice. Although this slot has no Wild symbols, the masks do duplicate themselves and deliver guaranteed wins. Masquerade has an RTP of 95.22%, which makes it a medium to low variance slot with some relatively frequent wins. 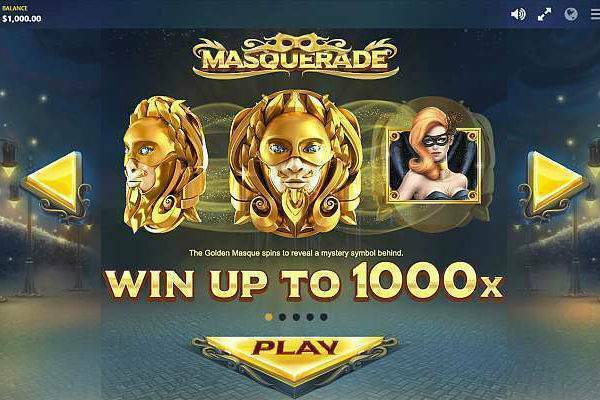 Take a look at Masquerade for yourself at these top online casinos. The game begins with you setting your bet. In Masquerade, this is rather straightforward, as there is a button that says “Total Stake”. Next to it are a Plus and Minus button, and with these you can adjust it to your desired bet size. You’re always betting on all 20 paylines, so there’s really nothing more to that. Minimum bet per spin starts at £0.10, which means it costs just half a penny per line! If you’re feeling extra lucksy, then the maximum bet here is £100 per spin. After that, you can press the Spin button on the right side of the screen. If you like your reels to spin just that much faster, there’s a Turbo button (looks like a Fast Forward button on a remote control) right next to the Spin button. Once you’re happy with your stake, give the Auto Play mode a shot. It’s right next to the Stake buttons. With Auto Play, you can choose how many spins you want the game to run for, with the option to set a loss limit if you like to play it safe. The Golden Masque, is a special one. It comes as a regular symbol and as a Super symbol. We’ll explain it all in the Special Features section! Masquerade’s base game has a fixed jackpot of 1,000x you line bet, and is won if you spin 5 of the Red headed lady touching each other adjacently. The next prize is 500x your bet, and can be won if you get 4 of the Red headed lady, or 5 of the rings. All Wins Pay Adjacent: First of all, the paylines are super easy to understand here. You just need to get at least 3 matching symbols touching each other on adjacent reels to win. So with that in mind, you know you can now be on your merry way towards more wins. Golden Masque: When you see the Golden Masque as a regular sized symbol, you can expect the Masque to duplicate and then reveal a mystery symbol underneath. Usually they come in clusters and have the potential to grow across the reals. The symbols revealed will all be matching, so get ready for some wins. Royal Masque: Once in a while, you’ll see a giant golden masque, this is the Royal Masque. It will cover reels 2, 3 and 4. This means you’ll be guaranteed at least one win when you see this happen! Masquerade is a beautiful slot. It’s set on an exquisite an elaborate stage at night, warmly lit with street lights, and the lovely lady accompanying you on your side. The symbols are beautifully drawn and graceful, and simply breathe theatrical elegance. The reels spin smoothly, with magical music and whooshes in the background. Masquerade is a mysterious but very straightforward game. It’s beautifully and almost indulgently decorated with Renaissance luxury, but when it comes to game play, you will master it in no time. All you need is to get at least 3 symbols touching each other adjacently to win, and the Golden Masque symbol will deliver matching symbols to increase your wins. Give this game a spin at one of our favourite slot sites.